The funny thing is, this was not intentional. 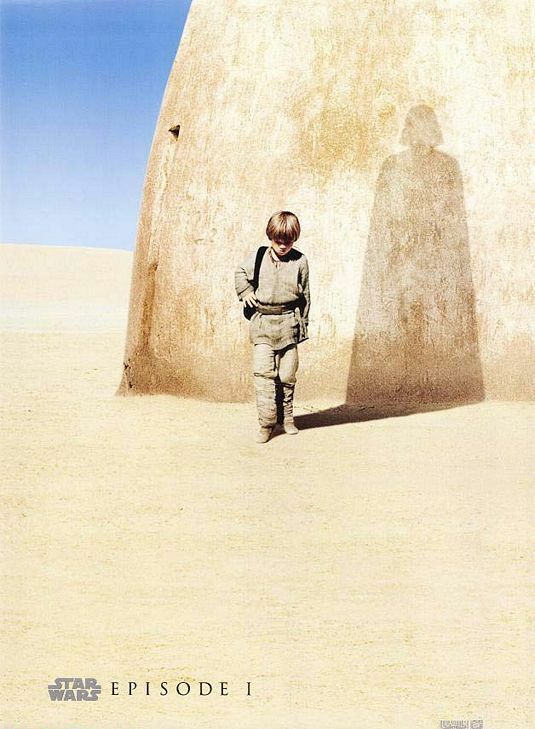 George Lucas noticed it during filming and used the lucky coincidence in the final cut of the movie. I'd like to know what Luke was thinking when he put the ship in the water. Especially, during his training he couldn't lift it out. The landing was perhaps more of a crash... a Jedi can lift a ship, but can he repair it when it is damaged? i'm not sure. If it were a crash, he wouldn't stay. Plus, the ship looked intact. Also, he fixed his ship in Dagobah. That was submerged in the mud. If it were a crash, he wouldn't stay. ... unless the crash was premeditated : we have been said Luke decided to retire. Is there a better way to retire than destroying the only way to go back ? Also, he fixed his ship in Dagobah. I imagine that all pilots have to know how to fix their ships. Hell, even Kaz has some idea on how to fix 'em. I think RJ is grossly underestimated by a lot of "so-called" "Star Wars-fans"! You are wise my friend, the shortsightedness and narrowmindedness of some who claim to be fans, never seizes to amaze me! The Dark Side does cloud everything indeed! Exactly! The LOTR and BTTF-trilogy both also have a lot of foreshadowing! Star Wars movies are like onions, everytime you peel off a layer, you'll find more layers. Another foreshadowing- Luke's "crashed" X-wing in the waters of Ahch-To. It gives hope Luke could leave the island. But Luke would have to make some major repairs to his ship first if he ever decides to leave. This could be seen as a foreshadowing that Luke will leave the island, but perhaps just not as expected- another case of subverting our expectations. Side note: I'd like to know what Luke was thinking when he put the ship in the water. Especially, during his training he couldn't lift it out. Luke... perhaps the best pilot in the Galaxy of his time? (after his father and before Poe) Crashed? No, I personally think he deliberately dumped (yes, I said dumped) his X-Wing in the ocean, because he did not intend to use it again and to keep himself from the temptation. Also a deactivated ship, submerged in water, seems harder to track! If it foreshadowed anything, it indicated something big was going to happen... Something we hadn't seen before from him, something that would truly show his immense Force-wielding-powers! When he didn't join the Falcon (with or without his [t]rusty X-Wing), I sensed he wouldn't be leaving! He could never get there in time, in person. I don't think it was that much of a stretch, with all the sabotage and the fact that nothing like that had ever been done before! Building something that big and that powerfull takes time! It also wouldn't surprise me they had already started plans on DS2! It just goes to show much effort is put into these films that the majority don't even notice. Yup! A damn shame really. Yet still they think they can make any judgements about them and spew their bile! Congratulations @NinjaRen, the staff and moderators have voted this to be Thread of the Week! Thanks! Is it possible to honor @RockyRoadHux too? This thread was a team effort, so she should get a "Featured Rating" too. I would like something like this for the making of IX. Here's an interesting instance of foreshadowing in TLJ...in my opinion! Here is what happens before the first "ForceSkype" session between Ben and Rey in TLJ. Note the peculiar shape of the light. To me the shapes look very much like the "sides" of the yin-yang symbol, indicating that Rey and Ben are the balance of the Force. We get a brief taste of that in the throne room fight when the Force theme plays very strongly and the two join up--just for a short time--for a common purpose that the Force approves of. Either way, not an accident. As much as I'd like to divide the credit between you two, when a thread is featured, the credit goes to whomever posted it...it's a software thing, and I can't co-byline it. we will all know Rocky ! the credit goes to whomever posted it...it's a software thing, and I can't co-byline it. Maybe submit a request to XenForo for a 'gestalt entity' feature! I have been in many a discussion with people do didnt like TLJ, although all of them online. Couple comments about this. 1. I find many that have only watched the film once or twice. Hard for them to notice all the nuance and foreshadowing. 2. The difference I find is that people like me who love Star Wars and TLJ feel sad for people who didnt like TLJ. While at the same time often the people who dislike TLJ are mad at me for liking it. I dont attack them, they attack me. Also I find it odd that I still have yet to meet one person in the real world who hates TLJ. It doesn’t just apply to the prequels but the whole saga . ( see the image above for the basic structure of ring theory at the beginning of my post ) . “So it is in all things I wish to prepare the way , for those who shall come after . And I remind myself in the force there is no end but only beginnings “. “ In darkness I follow the light and find my way to the beginning again , and again and again”. Pel , Disciple of the Whills. And it’s not just in the films but in the entire saga- lots of foreshadowing in Rebels for instance ( kanan and the wolves ). Even the world between worlds with its mirror like circle portals into time and circular as well as linear paths highlight how certain events repeat themselves over and over in time . It all goes back to the beginning and starts again - foreshadowing acts like a ripple in the force ( and time ) that sets out events in motion and determining that they play out again and again but in different ways . This is how I think Episode 9 is gonna connect to the whole saga through this idea of foreshadowing and events repeating ( in different ways ) themselves over and over but with different outcome . If episode IX really is the end of the skywalker saga it will complete the circle but hopefully course correct whatever it is that has gone wrong along the way that has led to where we are by episode IX. I can't help but wonder whether dead Yoda using the force is some kind of foreshadowing about what's to come in IX. Otherwise I fail to see what purpose that moment serves beyond being a cool effect. A tree shaped like the rebellion sign burning is cool, but I can't help thinking there's more to be revealed on that thread. Otherwise I fail to see what purpose that moment serves beyond being a cool effect. It served to teach Luke a lesson. I don't think it has to serve some further purpose. We really don't know that much about what force ghosts can do, but Yoda being able to call down lightning to burn a tree fits more into Obi-Wan's promise to Vader that he would "become more powerful than you can possibly imagine" than what we've seen in the past. But Yoda taught him that lesson with his speech after he burned down the tree, that those books held no relevant knowledge. Rey already has what she needs. That could have been said without the big effect. And now we know a little bit more about what force ghosts can do. I can't help but think there's a reason they pulled on that thread. Everything RJ did for TLJ was very deliberate.